Twizzle is a handsome little cat with an inquisitive face, huge green eyes and a playful disposition. However, behind his brave, furry smile lurks the sort of profound loneliness no cat should ever have to endure. Eight-year-old Twizzle has been dubbed ‘Britain’s loneliest cat’ after waiting for a home for months. He has spent 125 days at Battersea Dogs and Cats Home, without his forever human coming to claim him. Usually, a cat will only spend around 23 days before being brought to a happy home they can call their own. Twizzle turned up at his finder’s house one day last autumn, scared and hungry and not able to fend for himself very well. Before long he had got himself wounded in the face and they kindly took him to a vet for treatment, after which they brought him to Battersea. 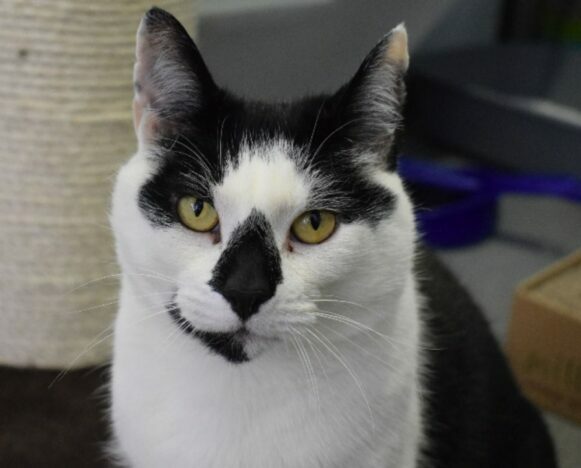 He was not sure of new people at first, but he has come far since this and made lots of friends with his playful and affectionate nature – and he does love to sit on the laps of his special pals. Sadly, Battersea workers believe the reason this gorgeous boy hasn’t been snapped up is because he has tested positive for Feline Immunodeficiency Virus (FIV). FIV is a contagious infection which is usually transmitted through deep bite wounds. Some cats can become unwell because of this virus, however most enjoy long lives without any more problems. Cats with FIV will however need to be kept indoors, or in homes with enclosed gardens, to avoid spreading the virus to other cats. 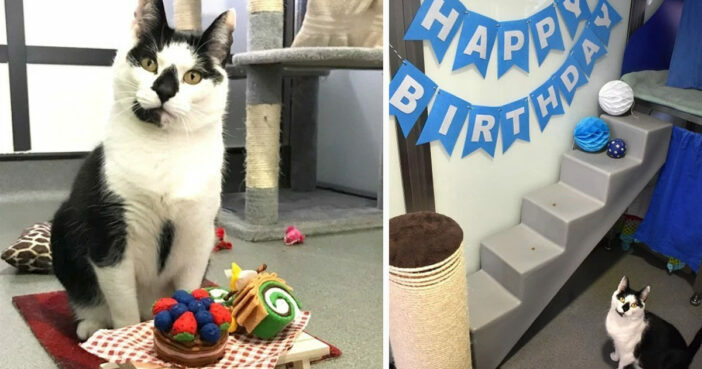 Twizzle is celebrating his birthday in March (complete with a party!) and he has a very special birthday wish: a new home where he can receive the sort of love and strokes befitting a soft and beautiful cat. Twizzle is such a lovely cat and it’s a huge shame that he has been waiting for so long to find a home. He is an intelligent, playful cat and has a lot to offer as a pet. What better birthday gift could you give one of our cats than a loving new home? Please, please somebody adopt sweet Twizzle soon. I honestly don’t think I will sleep tonight thinking about his hopeful little face gazing up from his lonely birthday party. You can find out more about Twizzle on the Battersea Dogs and Cats Home website.